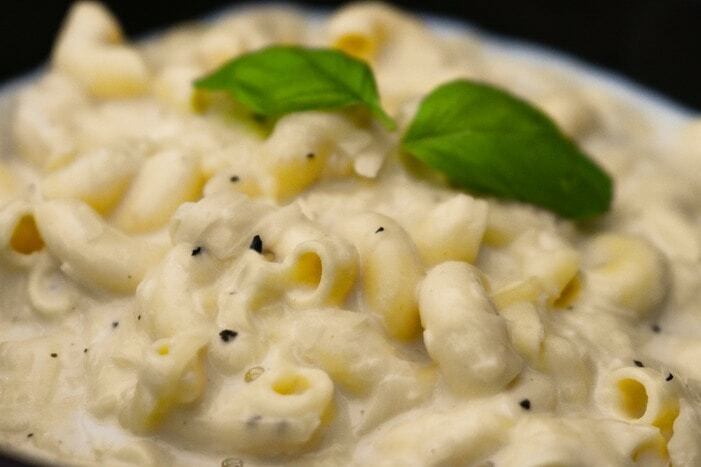 A luxury slow cooker macaroni cheese. The best mac and cheese I've made in years and the best part is this is a dump recipe. Dump in the ingredients, switch the slow cooker on and walk away. 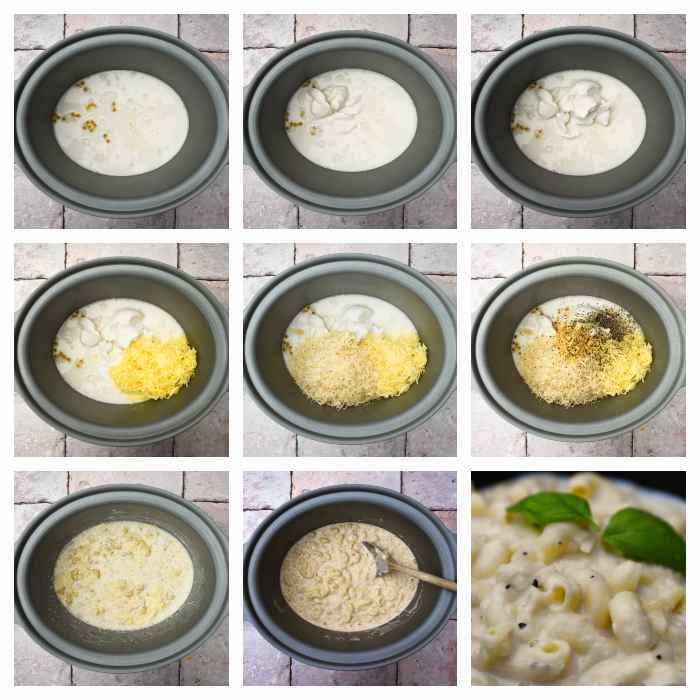 Macaroni cheese. We all love it. It's like a comforting hug in a bowl. When I was growing up my mum regularly made mac and cheese, although growing up in Scotland it was always called macaroni cheese. Whatever you call it, it's always a winner. This recipe is one of the easiest. No longer do you need to stand stirring a sauce and have several pans to clean. Now you can just dump in all in your slow cooker, turn it on and walk away. Leaving it to get on with making the most heavenly mac n cheese. Yes there is a lot of cheese in there. I did tell you it was luxury. I've made a slow cooker pot of this in both the vegan and vegetarian versions and they both brought about groans of pleasure. The full recipe is below, but I hope you now see just how luxurious and easy it is to make. It's often easier to make a vegetarian dish than a vegan dish, but it's getting easier all the time to make a vegan dish that is similar in flavour and texture. New products are coming onto the market all the time. Me, I can't be bothered with all the soaking of cashews overnight, so I'm delighted with all these fabulous products. Have I ever soaked a cashew? No! Will I ever soak a cashew? Probably not! These are our favourites, but there are others available. We like Violife all the way. The cream cheese is good, the cheddar melts so well, although it is very mild and their style of Parmesan cheese, which they call Prosociano is amazing. It has that tang of Parmesan and the same fabulous texture. If you want to add a really cheesy flavour to a dish, add this. Be generous with it over pasta of any type. For creme fraiche we like Oatly. Although they call it creamy oat fraiche instead of creme fraiche. We often add it to a creamy mushroom sauce too. We use like either Alpro single or Oatly creamy oat single (pouring) cream. They are both great in sauces. Use your favourite dairy-free milk, but maybe not a really sweet one. Save that for your breakfast cereal. Graham's favourites are Koko or Oatly. This recipe is total luxury and if you are on a diet don't make it. It is calorific, but it's also heavenly and will make you very, very happy. Make it for your family or yourself on a cold winter night and enjoy the warm hug it gives you. Food should be about pleasure too, so don't hold back. As they say everything in moderation! 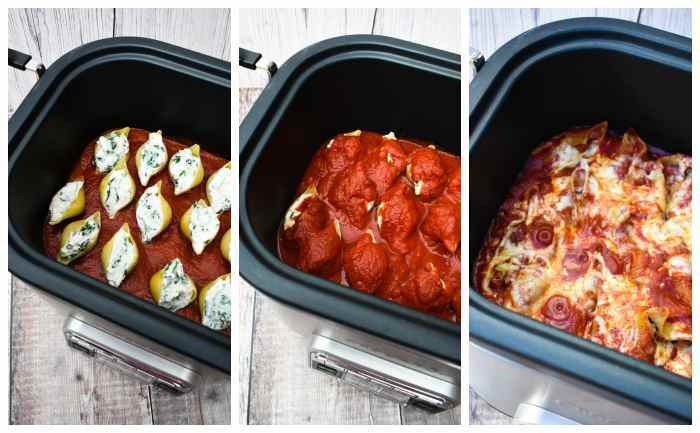 A dump recipe for the slow cooker. This luxury mac and cheese is the best you'll try. It's so rich, creamy and cheesy. It tastes totally sinful. 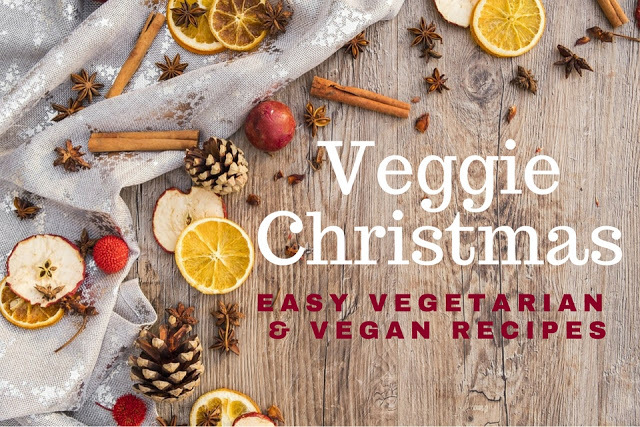 Vegetarian recipe and vegan recipe. Dump all the ingredients into a slow cooker and stir well to combine. Set to high and cook for 1 ½ - 2 hours until the pasta is cooked and the sauce is thick and lush. Stirring occasionally. Vegan Spinach & Cream Cheese Stuffed Pasta Shells - A simple recipe for a stuffed pasta recipe made in a slow cooker. The perfect midweek meal for vegans or vegetarians. Honestly, I hadn't ever bothered soaking a cashew either -- but I was trying to remake a recipe of my mother's, which meant I wanted to at least give it a nod to doing it right! I just tossed them in a cup of water overnight and went to bed -- so it was very PASSIVE soaking, to be sure! I ADORE that there are so many products now which make the long, hard effort a thing of the past, though. 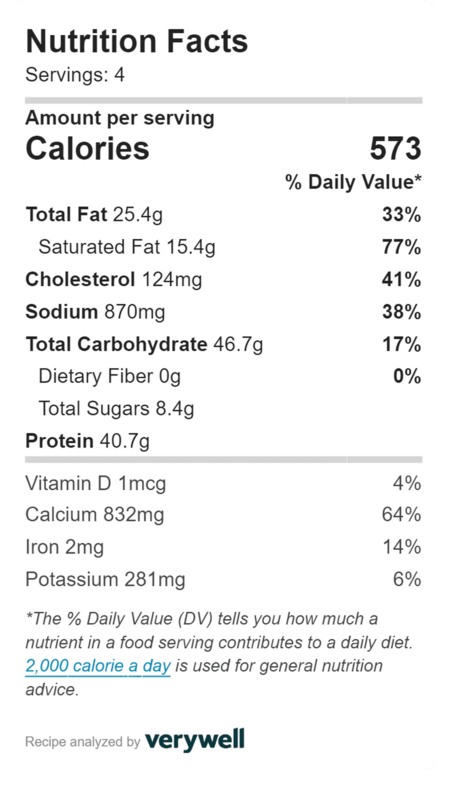 Vegan is getting easier every day. Well that doesn't sound too bad, but honestly I would forget. I tend to fly by the seat of my pants when cooking and decide on the day what I am cooking. I know, I know, I should be more organised. Just too much going on! Yes it is so much easier to cook and eat vegan, which is great. 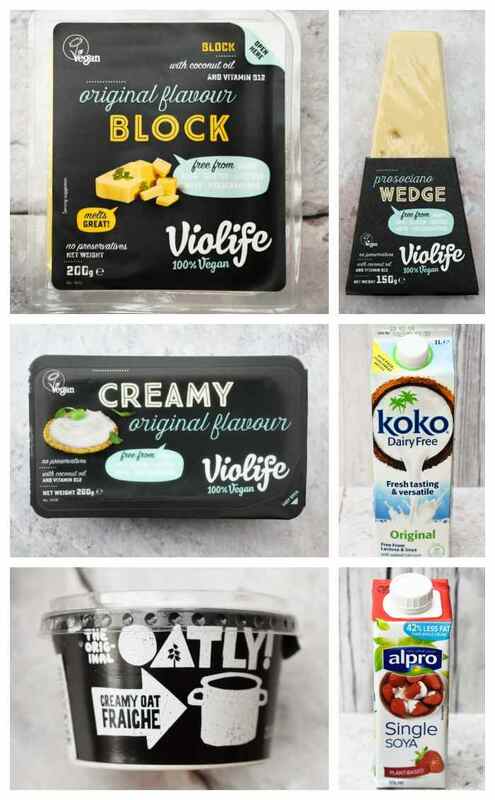 I'm interested in your vegan substitutes - I recently decided to check our biolife ingredients and it is similar to violife - lots of coconut oil but does not seem to have the sort of nutritional profile to replace dairy cheese for me, which is a shame as I love the taste of it. I am interested in the oatly products - a friend recently told me about a great vegan butter made from oats that he found at a market but has not found made widely - wonder if oatly do one! 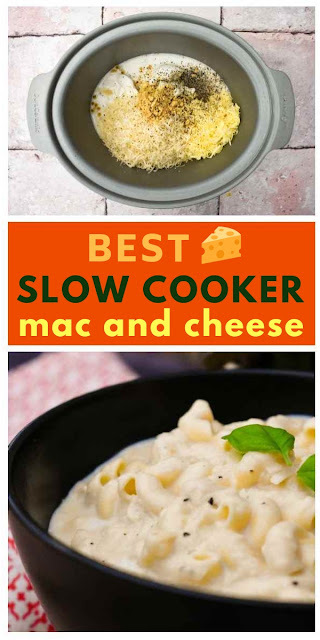 And mac and cheese in a slow cooker sounds great. Yes, I know what you mean, I don't use them for extra nutrition. I rely on the other fresh ingredients I cook with to cover that. This recipe is purely comfort and indulgence. I haven't seen any oat butter. 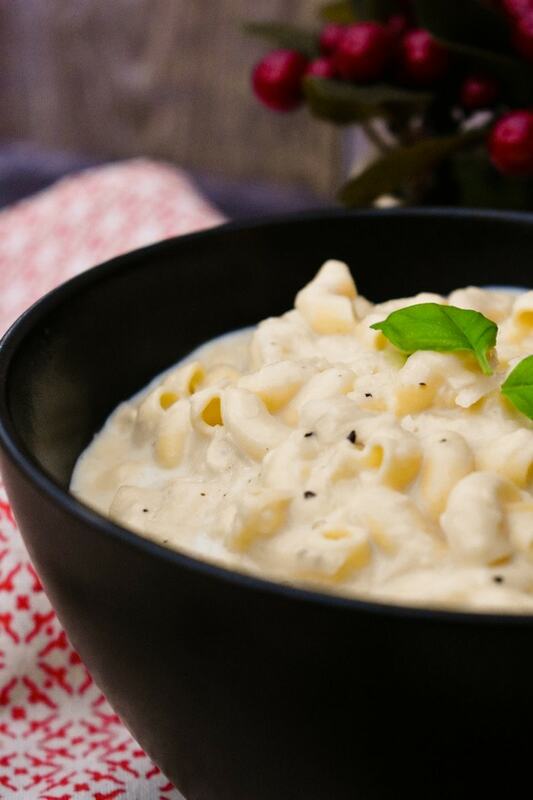 The slow cooker mac and cheese is so, so good! I'm in love with the ease of this recipe. Dump ingredients, and then slow cook. Looks so so good. Thanks Sara, I hope you try it. It is so good! Yes that has to be the bet part of this, well actually the creamy, cheesy gorgeousness is the best, but it is a really simple recipe, which is good to have. I hope you try it Jill.